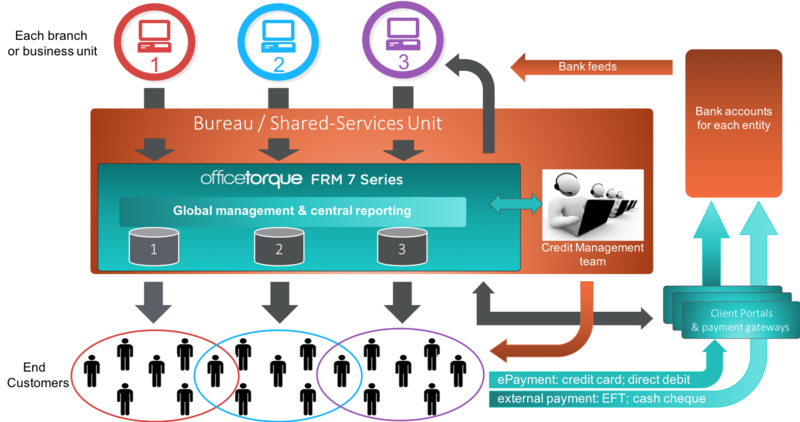 Where there are multiple business units, branches or a shared services arrangement within a group of companies, OfficeTorque has developed it’s FRM 7 Series solution. Incorporating all the same innovative features and functionality found in the FRM 5 Series, this ‘bureau’ platform also includes a Global level that allows multi divisions or branches to be configured across single or multi disparate ERPs to provide a single view and management of the billing and AR processes across the group. Unique branding, workflow and communications can be established for each business unit, while at the same time, allow for a Group view for both your internal users and, where appropriate, the convenience of consolidated Client Portal access across multi business units for your clients. The FRM 7 Series is ideally suited for business groups, property / strata management, franchises, and government environments.